Harbor seals, also known as common seals are marine mammals found across the Northern Hemisphere. Although mostly safe, some populations are threatened by various factors like disease, sealing, etc. Size: Males measure at around 63-75 inches (160-190 cm) and females 63-67 inches (160-170 cm). Weight: Males weigh between 176 and 375 lbs (80-170 kg), while females are 132-320 lbs (60-145 kg). Color – Variable from a brownish black to a silvery grey, the ventral sides are usually much lighter. They also have a pattern of spots which is unique to each individual. They live in shallow waters in bays, coastal regions, estuaries, rocky islets, and freshwater. They use tidewater glaciers for shelter, transportation, and breeding. They are rather common in somewhat cold marine waters which do not have yearly sea ice coverage. They are usually solitary but do congregate during the pupping and molting season. They do not exhibit any social structure during this time. They like to spend their resting periods usually in areas familiar to them. These sites are usually within 20 miles from the shore. 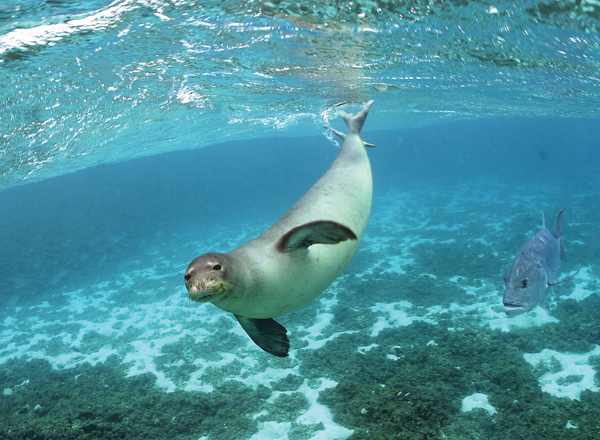 Although not migratory, they can spend many days at sea, traveling long distances to search for feeding grounds. They molt once a year immediately after the breeding season with the youngest molting first. Male harbor seals are believed to be monogamous. The female gives birth to pups once a year. The mating takes place underwater, thus negating the chance of studying that aspect. After a gestation period of around 9-10½ months, a single pup is born, although twin births have rarely been observed. 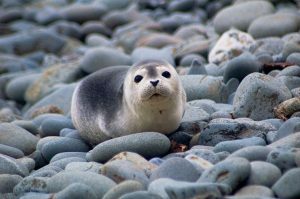 The pupping season varies with location, with the seals inhabiting the colder subarctic regions giving birth in July, and those at lower latitudes in February. The pups usually weigh at birth between 17-35 lbs. The mothers are usually the only ones looking after them. They are nursed for up to 6 weeks but grow quickly because of their mother’s rich and nutritious milk, doubling their birth weights by the time they are weaned, until which time, the offspring cling to the mother’s back when in the water. Males reach sexual maturity at 3 to 7 years of age, while females become mature at 3 to 6 years. 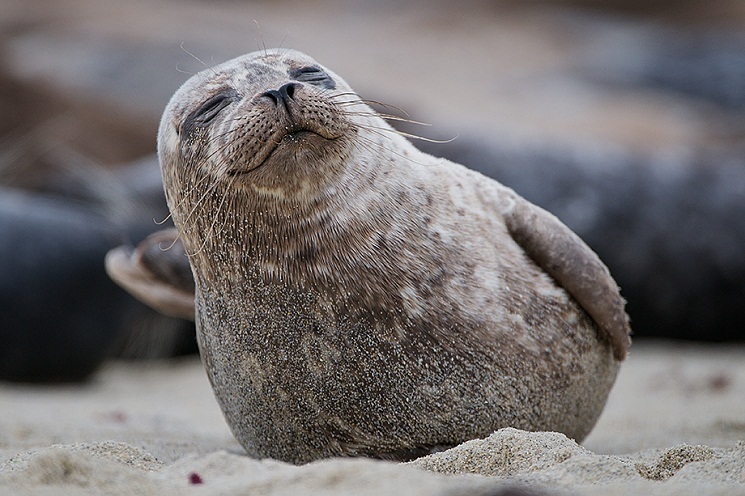 Females live longer than male harbor seals. The former may live for 30-35 years, while the latter only lives for 20-25 years. They communicate through yelps, grunts, and burps. They are a very alert creature and avoid making too much noise to be stealthy from predators. 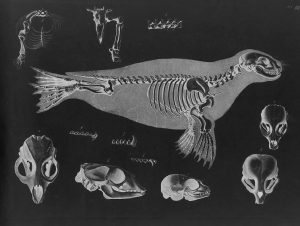 They are carnivorous, with fishes like sea bass, anchovies, mackerel, flatfish, herring, whiting, and cod making up the majority of their diet. They also sometimes eat crabs, mollusks, shrimp, and squids. 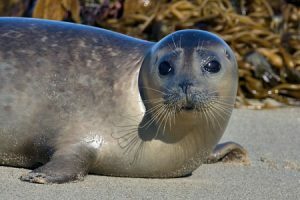 When underwater, harbor seals stop breathing so that their heart rate decreases leading to the conservation of energy. Also, they exhale before a deep dive which helps the oxygen accumulate into the muscles and blood, essentially reducing the oxygen content in the lungs. Their four flippers assist them to move around in the water, with the hind pair propelling them forward, and the front two helping them steer themselves. A higher metabolic rate compared to mammals of a similar size helps them produce body heat to keep their bodies warm. A thick blubber helps harbor seals keep themselves insulated, thus decreasing heat loss. When on land, dilation of the blood vessels in the skin occurs to aid in the release of heat from the body. They sleep in the water using a posture known as ‘bottling,’ wherein their bodies are submerged in the water vertically, with just the heads above the surface to aid in breathing. They have narrow nostrils which close during their time underwater. 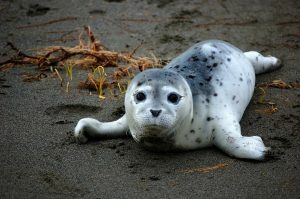 Killer whales (orcas), white sharks and polar bears prey on harbor seals. 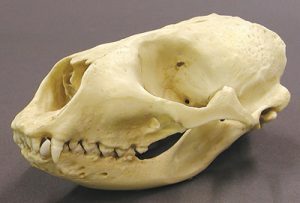 Coyotes sometimes hunt common seals when they are on land. 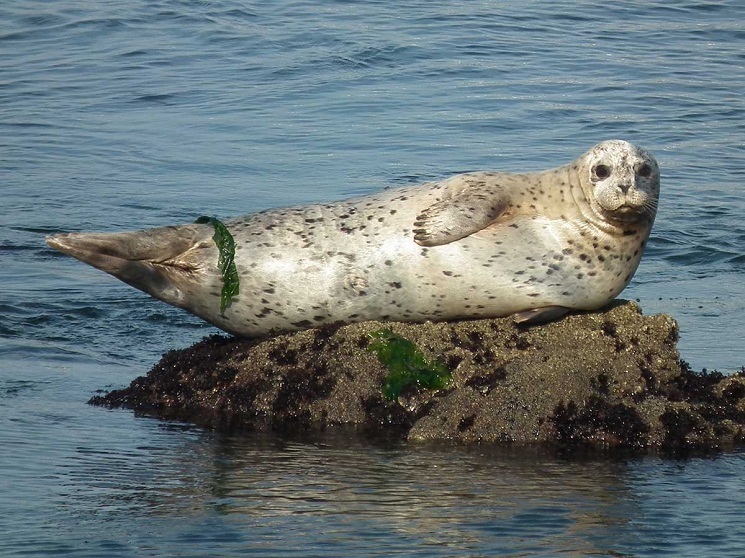 IUCN has listed the harbor seal under their ‘Least Concern’ category. Their total population is estimated to be around 350,000-500,000 individuals. 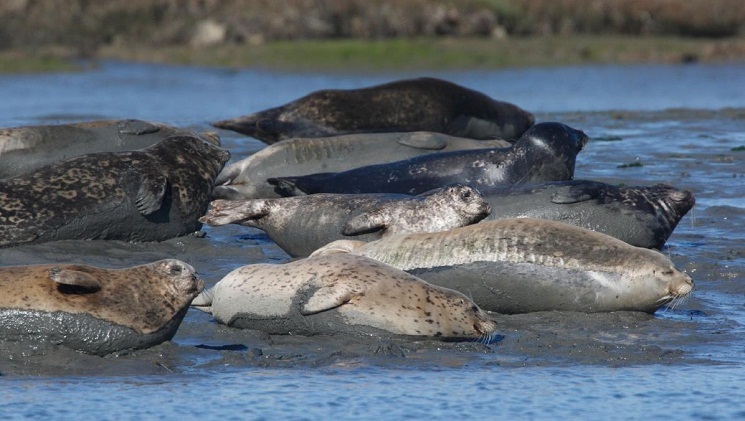 Harbor seals share a common ancestor with bears and canines (dogs, wolves). They move on land using a caterpillar like locomotion process.